1983-08-04. New. Ships with Tracking Number! INTERNATIONAL WORLDWIDE Shipping available. Buy with confidence, excellent customer service! 1983-01-03. Good. Ships with Tracking Number! INTERNATIONAL WORLDWIDE Shipping available. May not contain Access Codes or Supplements. May be ex-library. Shipping & Handling by region. Buy with confidence, excellent customer service! Caxton Pr. Hardcover. 0870042971 Like New Condition. . Fine. Caxton Pr. Hardcover. 0870042971 New Condition. . New. 1983-08-04. Good. Ships with Tracking Number! INTERNATIONAL WORLDWIDE Shipping available. May not contain Access Codes or Supplements. May be ex-library. Shipping & Handling by region. Buy with confidence, excellent customer service! Caxton Printers Ltd, 1983. Hard Cover - VG/VG - Book and dust jacket are clean and tight with light wear - Illustrated - Index -195 pages.. Hard Cover. Very Good/Very Good. Caxton Printers. PAPERBACK. 0870042912 New Condition. . New. Caxton Printers. PAPERBACK. 0870042912 Like New Condition. . Fine. Caxton Printers Ltd, 1983-05. Hardcover. Good. U.S.A.: Caxton Printers Ltd. Fine. 1984. Glossy Soft Cover. 0870042912 Oversized 195pp including bibliography, index, and large fold-out map Photographs Stapled wraps to insure the book will remain tight Cover is lightly scuffed . Caxton Printers, 1983. Paperback . New. Some rubbing to rear cover. This is an unused book from the warehouse of a former new-book distributor. Caldwell, ID: Caxton Printers, 1983 195 pages of pictorial history of an area that has produced mining wealth far exceeding that of the famed Comstock Lode. Many photographs by Warren McGee, Phil Hastings, F.J. Haynes, Ron Nixon, Otto Perry and Don Roberts, and from the Barnard-Stockbridge Collection (on glass plates) at the University of Idaho Library. Map endpapers. Small name stamp on the front endpaper. Fine in near fine dust jacket with moderate rubbing to the rear panel. . First edition, first printing. Hardcover. Book. Caxton Pr, 1983-05-01. First Edition, First Printing. Hardcover. Like New/Very Good. Text is clean, unmarked, as new. Dust jacket shows signs of shelve wear on back side; has slight tear on top and bottom of spine. Has red linen covered boards with gilt lettering. Features maps on both end-sheets and 6 maps internal; has numerous illustrations. Includes flyer from publisher. Dust Jacket protected by mylar cover. Caxton Pr. Hardcover. 0870042971 . . Fair. 1983. Caxton Printers, 1983 Cover has edge wear, creases, minor scratches, small bent/rubbed cover/page corners, rubbed spine. Minor foxing inside covers/on free end pages. No writing. . Soft Cover. Very Good. Caldwell ID:: Caxton Printers, Ltd.,, 1983.. First Softcover Edition. Softcover. Quarto, about 11 inches tall, in photo illustrated brown wraps. 195 pages illustrated by photographs and maps, one of which is folded and tipped in at rear. 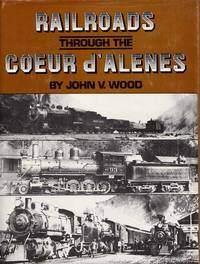 A photographic history of the Union Pacific and Northern Pacific through the northern Rockies from Missoula to Spokane. Published in hardback as well. Minimal rubbing and edge and extremity wear. Otherwise clean and bright and soundly bound. Caldwell, Idaho: The Caxton Printers. 1984. Quarto Size [approx 24cm x 30.5cm]. Very Good condition in Very Good Dustjacket. DJ protected in our purpose-made plastic sleeve. A nice copy. Illustrated with Black & White Photographs and Maps. 195 pages . 2nd Printing. Hardback. Caxton, 1983. 1st Edition. Soft cover. Very Good/No Jacket. The wraps are a touch rubbed and edgeworn. Internally clean and tightly bound. Minor foxing and glue is visible at the hinges. Caxton Printers, 1983. Paperback . Acceptable. This book was completely split in half, the paper on the spine has been reglued but the text block is still split. The book is complete and intact, but fragile. Expect pages to come lose with shipping and use. As is, price reduced due to condition. Still a great reading copy! Caxton Printers. Good+. 1983. Paperback. 0870042912 . Clean and unmarked, covers have some wear. ; 8.43 X 5.87 X 0.75 inches . Caxton Printers, 1983. Paperback. Good. Caxton Printers. Used - Very Good. Ships from Reno, NV. Great condition for a used book! Minimal wear. 100% Money Back Guarantee. Shipped to over one million happy customers. Your purchase benefits world literacy!